As the name implies, a side by side fridge has the main freezer compartment situated adjacent to the fresh food compartment. These fridges are ideal for large family households as they provide ample storage space to meet their needs. These fridges come with accessories such as ice and water dispensers, and drink access from the front of the fridge door. Families whose freezers are overflowing and who store a large amount of frozen foods will find these models to be more efficient. An average side by side fridge puts door space to good use. The doors are not only deep, but also lined with easy to reach food compartments. In comparison to other models of fridges, the side-by-side model consumes 7 to 13% more electricity. This is because the tall narrow freezer compartment is harder to cool. Also, if family members open both doors at once then it is likely that the freezer will need to use more energy to maintain its temperature. Ideally, in order to opt for an energy efficient fridge, one should look for a model that allows you to open either or both doors and are not forced into opening both doors just to gain access to the fresh food compartment. More power is required to keep the larger sized freezer at its desired temperature. These fridges are also more expensive to purchase and repair. 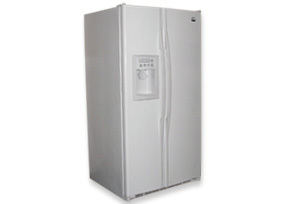 Energy Star compliant fridges are the ideal choice when trying to save energy. The highly efficient compressors, combined with improved insulation, temperature and defrost mechanisms helps to improve the energy efficiency of the fridge. These refrigerators are known to consume at least 10% less energy that the Federal Standards norms. With the freezer and the fridge located next to each other side-by-side, these fridges are not very wide. This means that storing large platters becomes difficult in these fridges. A solution to this is a pigeon pair, a separate vertical fridge and freezer next to each other. The benefit of this arrangement is that you have a full size fridge and freezer at your disposal. The advantage of using a side-by-side model is that access to the freezer is easy.